Elmo - Looks like it's going to be a "bun" summer for everyone! wow, i had no idea BUN was pronounced like "swoon." the whole time i thought it was pronounced BUN, like, ya know, BUN! which is why i couldn't help cracking up at sentences like "But unlike Pam's, my bun came in a boat." yeah, i know i'm immature! So Elmo - Do you really like the shredded pork with Com Tam - sometimes I've had the shredded pork and they taste like rubber bands? But the steamed egg - oh man, that's really good stuff! 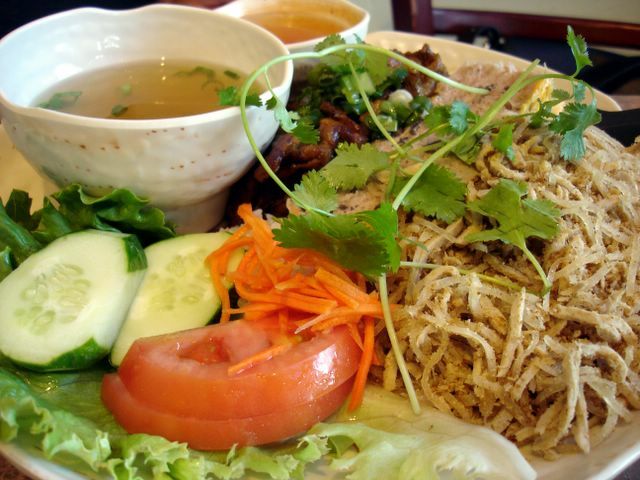 I like shredded pork with Com Tam! And I would even eat them in a BOAT. So I will eat bun in a spoon. And I will eat bun with a loon. And I will eat bun in a BOAT. And I will eat bun with a coat. And I will eat bun here and soon. Say! I will eat bun on the moon! bun and shredded pork with com tam! Elmo - hahahaha, can't stop laughing! yoso-poetic! This is a classic....Thanks for making my morning. Thanks MzMaggie! I appreciate your comments! Pho Bac is the best PHO in the Irvine/Tustin area in my opinion. I am usually there for a large #10 (Rare Steak Pho) but today after reading your blog got excited for a Vermicelli bowl, #56. I know it's the best because being a foodie I talk to everyone from different nationalities about their favorite food and I did just that at Supercuts with a lady from Vietnam. 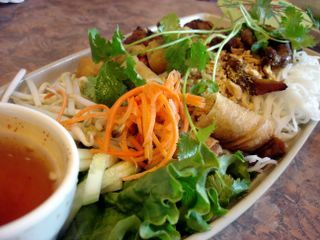 She called me out with her co-worker leaning in close when she asked where do I get my Vietnamese fix locally. I responded with Pho Bac of course and her co-worker looked at her and said "oh he knows what he is talking about." There is nothing more I crave then Spicy Pho, mmmmmmmm. how much is a regular pho?